In honor of His Noodley Greatness. Happy Holiday to all my Pastafarian friends! FSM, Treasure and Sushi, RAmen! It's a Series of Noodles! 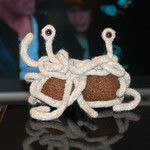 Can you see His Noodly Appendage?